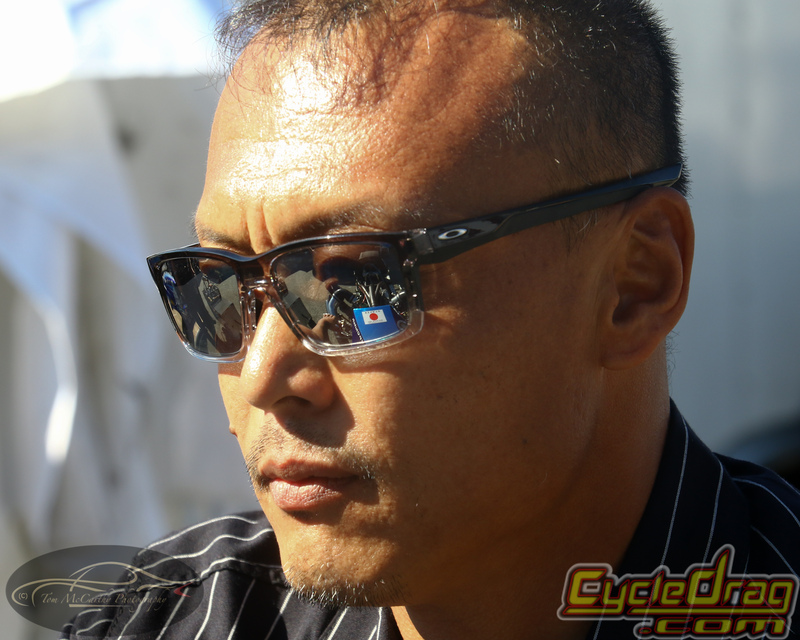 At the NHRA Lucas Oil Winter Nationals on the weekend of February 10/11, 2018, Tak Shigematsu, the 53 year old Top Fuel motorcycle pilot from Japan looked a bit rough around the edges on Sunday morning and he had every right to look that way. It was Sunday, race day and he wasn’t racing. He had every reason under the sun to look like hell and he did – blatantly so. The eight bike qualified field for the race was about to go out in front of a few thousand fans and do battle. Tak decided that due to his Top Fuel motorcycle’s lack of correct function, he opted to not race in order to better address his problem: a pissed off motorcycle that no one could make operate correctly. So rather than take it out onto the 1320 and blow it up – again – he stayed parked on Sunday morning, much to his dismay. He was not only over-tired, he was disgusted. Tak had flown over 16 hours from Japan to Orlando, then drove 35 hours across the American South West, to suffer at the hands of the Gods of Thunder. And the Gods were making Tak suffer mightily as well they should: you don’t get to achieve greatness easily, you have to earn it. The Gods of Speed and the Gods of Thunder will tell you when they are done with you IF you are worthy of their respect. Please note, not everyone is; not just anyone will succeed in impressing the Gods. Failure is more common than success, that’s why they call it greatness. 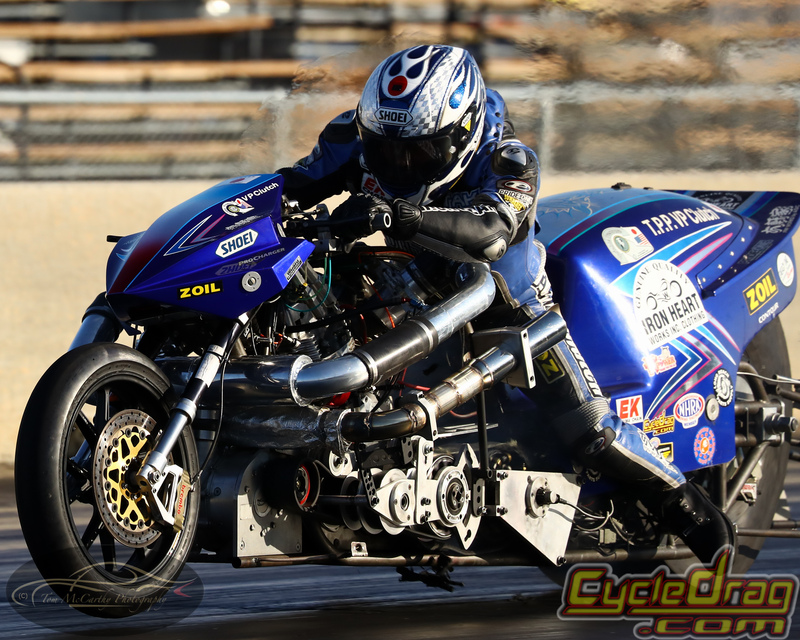 The great achievement Tak sought to ascend to was the running of the first ever 5 second elapsed time pass in the history of Top Fuel motorcycle drag racing. What he was served up by the Gods of Thunder, for his efforts, was an oil pan full of broken connecting rod parts that looked like an aluminum salad with 50 weight dressing as a side. It was ugly. 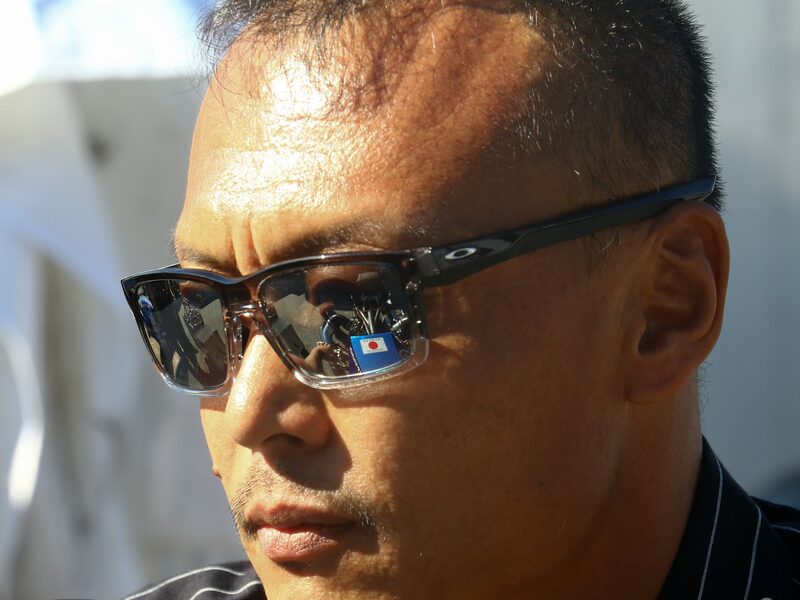 To be clear about this, Tak and his crew arrived at the race track days in advance of the race to go over everything and make sure the bike was right and ready to go. He’s been as quick as 6.0 before and it’s that next tenth of a second that’s needed to carve his name in the history books for all-time. He was ready, his team consisting of veteran racers like Don Johnson, and Kirby Apathy; they were ready. They were convinced the bike was ready. But the Gods of Thunder were not ready. Takeshi Shigematsu aiming for a five-second pass. So the Gods of Thunder, being the mischievous bunch they are, they decided to make Tak’s oil pump fail during a qualifying run and trash his motor. 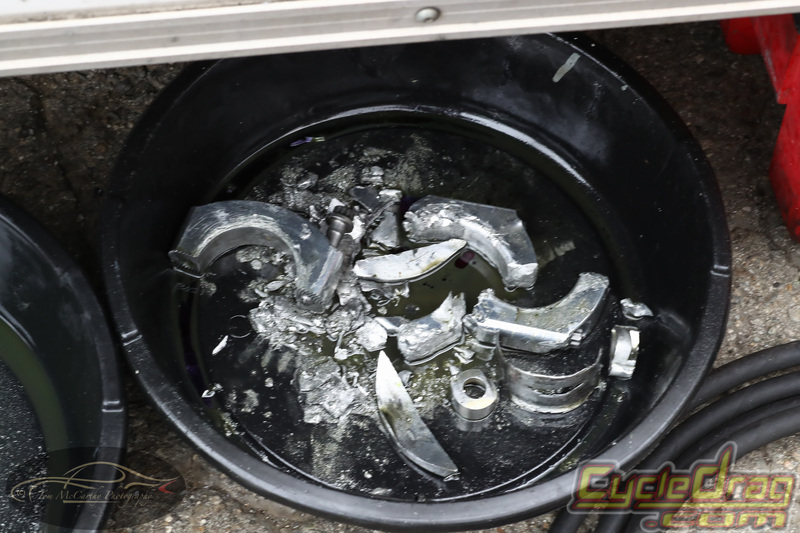 A connecting rod shattered, valves became paper weights and the bike required over-night maintenance every damn day of the race. For several days in a row, Tak’s band of brothers worked past midnight, every night, trying to get his Top Fuel Harley to act right. It refused. 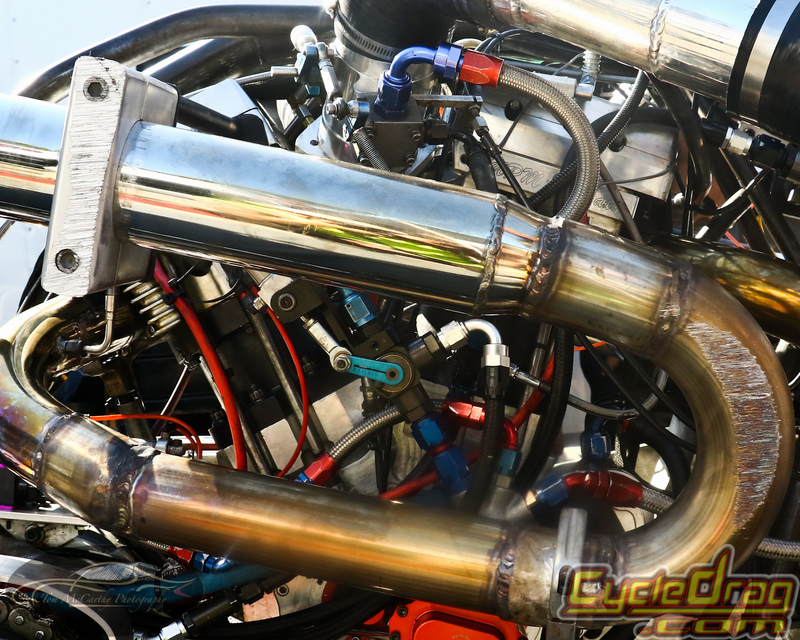 Men with over forty years of building and racing drag bikes were shaking their heads about the bike’s refusal to run properly on Sunday morning – it defied logic. Let me assure you, logic is not always part of the Gods of Thunder’s program. Making racers earn their place in the pecking order of achievements: that’s what they do. You have to earn it, the right to achieve greatness. Great men achieve great things in life but only at great cost. First you have to work for it, then you suffer for it. Then and only then, if you’re deemed worthy, will some measure of success come to the few who are resilient enough to pay the price. Take the case of Larry McBride for example. He’s the first Top Fuel motorcycle pilot to breach the five-second elapsed time mark and he did so October 31st, 1999. But to get there Larry first had to race T/F motorcycles for over twenty years and watch helplessly as his best friend died on a race track right in front of him on September 1st, 1996. 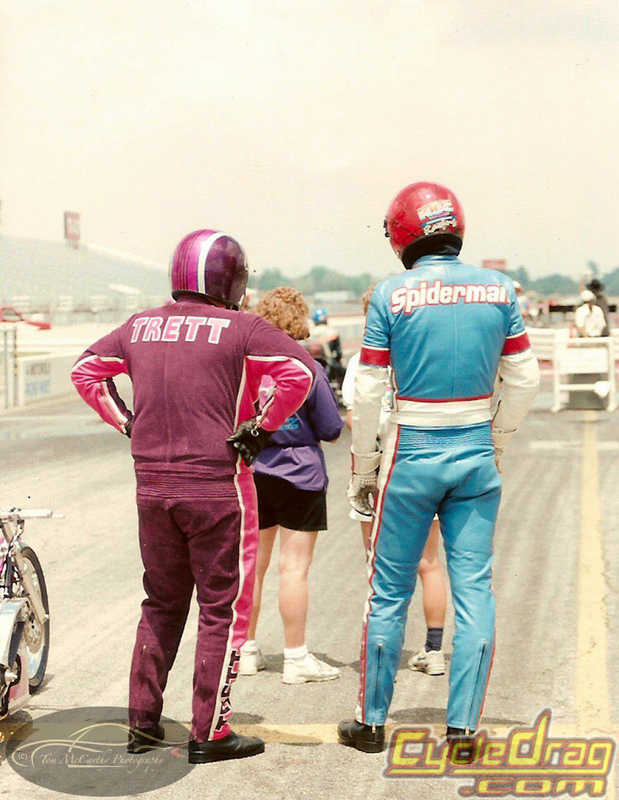 Larry stood up off his Top Fuel bike that day, took off his helmet and said to his brother Stevie, “That’s it, we’re not doing this anymore, I’m done.” He quit Top Fuel motorcycle drag racing that day, the day Elmer Trett died. His heart and his spirit were broken. The Gods of Thunder can be very cruel. But when Larry was one of the six men chosen to lay the greatest motorcycle drag racer that ever lived to rest, on the day of Elmer’s interment, Elmer’s widow, Jackie Trett, came to Larry and grabbed his arm, then looked him in the eye. She said to him “You have to go on, you have to keep this class alive, Elmer would want it that way. Elmer would not let you quit, don’t do it.” Larry reluctantly shook his head as he cried, but he understood. She was right, and he was wrong to quit. It then took Larry McBride from September of 1996 till the last day of October, 1999, to run the first 5 and earn his place in the history books. It is not known how many shattered connecting rods, torched pistons, transmission sprags, or failed oil pumps it took to appease the Gods of Thunder, so Larry could ascend to greatness. But what is known is that he endured whatever it took to get there and he’s still at it. Shigematsu understands this, he knows what it takes. He lost his dad, just weeks before 2018 NHRA Winter Nationals and he was still reeling from that at the event. There’s a hole in his heart that will not heal anytime soon. Then came the metal carnage in Pomona: he’s being tested by the Gods of Thunder. There is a price to be paid for greatness: Sometimes men achieve great things in life but only at a very great price to do so. 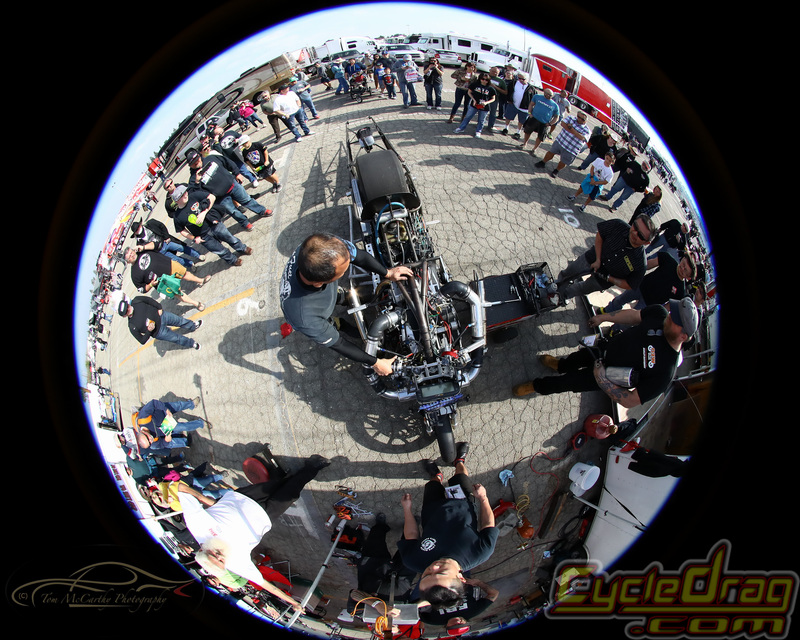 Only time will tell if Shigematsu is the man who will run the first five-second elapsed time pass in Top Fuel Harley history. Right now, he’s paying his dues and the Gods of Thunder are watching. This is the price of greatness.